Panelists examine China's role in the world, its ongoing trade conflict with the United States, and President Xi Jinping's political and economic agendas. I’m James Mann, author in residence at Johns Hopkins SAIS, or School of Advanced International Studies, and I’m going to be presiding today. And we have an excellent panel here. You have their extended bios, but we have three people here who have been—have long experience in dealing with China and China-related issues. On my far right is Bonnie Glaser, senior adviser for Asia and director of the China Power Project at CSIS. Longtime leading expert on China for CSIS. Sherman Katz, who is now senior fellow at the Center for the Study of the Presidency and Congress. And before that I first met him at CSIS, and he was at Carnegie after that. And Michael Pillsbury, currently director for China strategy at the Hudson Institute, who has been—over the years had many China-related jobs. Most notably he was a consultant at the Defense Department and really one of the protégés—one of the people who worked for Andrew Marshall, who just died yesterday. I want to start right in. And what I’m going to try to do today is get beyond the day-to-day events, although we will—we will touch on them for sure, and ask—it’s now been a little over two years with the new administration. The first question is: Is the current American policy towards China a radical discontinuity with the past, or maybe not as different as it seems? And more importantly, what do you think the Chinese leadership’s strategy is for dealing with the current administration? Is it threatened by a different kind of president? Does it feel confident it knows how to handle him? What is the Chinese leadership trying to do in the current period? And, Bonnie, could I ask you to start? GLASER: Thank you, Jim. I think I’ll take on the latter half of that question and let somebody else talk about U.S. policy. I think that the Chinese have been—they have been off-balance regarding President Trump. There have been ups and downs. I think when President Trump was first elected, not yet inaugurated, they were so surprised by the president’s phone call with Taiwan President Tsai Ing-wen and the unwillingness of President Trump to even reiterate the “one China” policy. And so at that moment I think they were quite anxious and uncertain about where the administration’s policy would go and what the relationship would be like. Subsequently, I think when Xi Jinping met President Trump at Mar-a-Lago, maybe he was—I think he was quite confident. I was going to say maybe he thought he had President Trump in his pocket, but probably not quite that confident. But we have seen these ups and downs in China’s level of confidence. There is one consistent practice, and that is that the Chinese just keep reaching out to everybody that they think has some insight into President Trump and administration thinking. So we see them inviting all sorts of people to talk to, and they started out with Jared Kushner and Ivanka Trump and branched out from there. But this includes journalists and others who have—they think have access. So I think at this particular juncture that the Chinese are hoping that they will get a trade deal with the United States, and that that will stabilize a portion of the relationship. But what I’m hearing is that people in Beijing, at least in the shall we say, you know, sort of scholarly community of people that I talk to, are concerned that after a trade deal is signed that we will see an uptick in other areas of tension, and particularly in the security realm. And given that the Chinese see more U.S. operations in general in the Western Pacific—in the Taiwan Strait, which of course was reported the other day, one of many normal, routine transits through the Taiwan Strait; and FONOPs that go on, the freedom of navigation operations; and many more cruises in the South China Sea—so I think there is concern in China that if they stabilize this part that other things will pop up. So I think they continue to be concerned about what they see as the unpredictability of President Trump and the administration’s policies. MANN: OK. Mike, do you want to address that? PILLSBURY: I think there is both elements of continuity between President Trump and previous administrations on China, and also elements of difference or newness. The president himself seems to very much like to say that I inherited a mess. He said this again this morning. He likes to say about China, you know, I don’t blame the Chinese for their misconduct; I blame previous American presidents. So, obviously, he sees himself as new and different. If you take a more cynical view, I think I’ve been at this 50 years or so; you see elements of continuity are really quite striking: the State Department and Defense Department, what the president might call the deep state. The deep state started to change its mind about China several years ago. Clearly, the last couple of years of the Obama administration a number of things began to happen that are—have high continuity with the Trump administration. I agree with Bonnie on the Chinese effort to understand President Trump. I don’t think he’s unpredictable in their eyes; I think they see him as a puzzle to be analyzed. And they had a team of America watchers in Beijing, two of which showed me in writing in advance of the election what the Electoral College vote would be, and that Trump would carry Wisconsin, Michigan, Pennsylvania, quite against the American mainstream press at the time. These people on this sort of Trump analysis team, if we were to give them a name, they have read all of his books, not just Art of the Deal but the other thirteen. There are sections on China in several of his books. They can quote this to Americans. So I think their analysis of him has been a matter of great debate in China because one of the issues they have about their own strategy is shall we change our strategy—which I try to describe in Hundred-year Marathon—shall we change our strategy in any significant way, or can we deal with the challenge from President Trump with our old strategy? And my impression is they’ve made the decision not to change their long-term strategy, that whatever President Trump has done so far they can incorporate in their strategic thinking of what they thought the Americans would do. I don’t know if you’ve seen this document that’s made the rounds many years ago asking a Chinese Central Committee expert what is the greatest challenge, foreign—what’s the greatest foreign policy challenge China faces in the next decade. And the answer he gives to the National People’s Congress Committee was managing the peaceful decline of America—(laughter)—as China’s greatest challenge. And as they measure comprehensive national power and they sort of get a sense of what they sometimes call in China Daily—which I recommend everybody should read and subscribe; I do—China Daily sort of talks about the Americans, of course they’re a little bit desperate or panicked right now because they know, you know, the writing’s on the wall that China is going to play its proper role in the future. PILLSBURY: You’re missing a lot, Jim. Sherman, let me ask you about one part of the Trump policy that does seem to be different is an effort to change China’s we could call it industrial policy; you can call it what you want. It’s more than industrial policy; it’s state-controlled economy. Tell us about that and whether you think that it’s—it can be changed, that—whether any efforts to do this will succeed or not. KATZ: Thanks, Jim. Thanks very much to the Council for including me. I am the trade lawyer in the panel. They have vastly, the other two speakers, vastly more experience living and working and speaking Chinese than I. So I hope you’ll bear with me. On industrial policy, it’s a fascinating subject. It’s a hugely difficult problem in our relationships with China—totally different economic model, state-led. Xi Jinping seems to be taking it even more in that direction. Some say he’s perhaps gone too far and needs to come back and balance a little more. China says that it needs its subsidies for industry to help increase income. After all, it says, the annual per capita income is $8,000 while the OECD average is $30,000 and the U.S. average is $56,000. And it also says it needs these subsidies in order to compete in the global marketplace. Now, we’ve not heard a great deal yet from USTR, other than the determination to tackle this part of the dilemma. Sherrod Brown, interestingly, during Senate Finance Committee hearings, asked the USTR, well, nine of the ten largest steel companies are state-owned enterprises; is that going to change? And Lighthizer said, essentially, we have got to do something about that, and I’m determined to do something about that, and it’s essential that whatever I do be enforceable. So I think we need to stipulate in talking about the agreement—except for Mike, who may have seen a copy—that we don’t yet know what’s in it. So we need to stipulate probably. So we don’t know yet what’s on this difficult issue. But let me briefly talk about an effort you may not know so well, and that is the trilateral group—U.S., EU, and Japan. In December of 2017, based on shared concerns about Chinese subsidies and state-owned enterprises, this group, the ministers—trade ministers started to meet to figure out what to do about it. Now, I confess on a side note here I’m a great believer, as you’d expect perhaps from lawyers, in the WTO. I think it is the only set of global trade rules that embodies transparency; rule of law; nondiscrimination; and is also a base, I think, for building global support to deal with Chinese economic practices. MANN: Has China been held to those rules? KATZ: Well, so here’s a mini—here’s a mini-effort of these three. They met three times last year, once in January, and they are at the point of publishing a finalized text on subsidies which proposes increased transparency of SOEs; mandatory notification of subsidies at the risk of penalties like losing access to documents; overcapacity subsidies—this is a huge problem, particularly in Chinese steel; definition of what a public body is so that we’re sure that state-owned enterprises are in the ballpark. In short, here are three major economies working together to reform the rules. Now, everyone in this room knows you can’t make those reforms without China approving them. And so the three are reaching out to other countries—New Zealand, Australia, Mexico, Canada—trying to build their leverage. USTR negotiators tell me that China is concerned about this. My point is that in order to cope with this industrial policy, I think the United States needs to work with its allies and build consensus on what kinds of changes we need to make. I’m not saying that’s going to solve the problem in a single stroke. It’s a huge problem. But it’s, I think, one of the best tools that we have. MANN: That’s a perfect segue for my next question, which was to Mike. You think about questions of global strategy and you also have emerged in a role as explaining the Trump White House. So how can you have a policy that alienates Europe when you’re trying to carry out certain goals with China? Would our China policy be strongest with a stronger relationship with Europe or without alienating Europe? PILLSBURY: Yes, of course it would be. I disagree with Sherman on his characterization of the WTO. There’s some very important people who—and I’ll give the names—who believe that China should not have been allowed to join the WTO, that it fundamentally was not qualified. One of them is Nancy Pelosi. The other is Bob Lighthizer, who took note of Nancy Pelosi’s objection publicly in his testimony to House Ways and Means. There’s quite a bit of bipartisan support for the tariffs, as well. I don’t think it’s so popular in, let’s say, the Council on Foreign Relations, which is famous for free trade and tariffs are evil. But in our political system as the Chinese analyze it, it’s not just President Trump trying to alienate the Europeans. The Chinese would probably discount that as not an accurate characterization. They tend to analyze President Trump, at least in what they tell me—and they debate this in Beijing—but they tend to see him as organizing a global coalition against China. And this is a theory they had before about some previous presidents. But they work in some little tidbits, like the renaming of the Indo-Pacific Command, the president’s bringing up more than fifty times now the idea of a free and open Indo-Pacific without much of a further definition of what that means. And as the Chinese ask, is there a new organization for the Indo-Pacific Strategy? You know, can we meet the person in charge of it? And we have to tell them it’s a little bit like air-sea battle, you know; it’s not really about you. And plus, there’s no new organization. PILLSBURY: What President Trump’s trying to do, though, in a larger sense, in part of his election campaign and some of his earlier writings he attacks our allies in ways that make people in the Council on Foreign Relations, you know, gnash their teeth. He attacks them for unfair burdens being placed on us. This is not a fresh idea with Donald Trump. It goes way back to the ’50s, when the NATO allies wouldn’t meet what was called the Lisbon Accord to bring up the number of divisions. Germany never got to even 2 percent of its defense budget. So what our Chinese friends like to do is analyze, OK, Jim Mann thinks, you know, that this is alienating the Europeans; is it really? And what they see is investment screening adopted by the European Union very much in lockstep with the American CFIUS reform bill that passed the House of Representatives—controversially, half and half? No; four hundred to four. The Senate cosponsor was Dianne Feinstein. So they’re looking at facts on the ground. There’s now much tougher investment screening for China by the Europeans and by us. There are quite a few other examples of European Union, let’s say, cooperation with President Trump. But some people like to exaggerate the friction. And this old idea that they’re ripping us off, you know, and they’re not pulling their fair share, that’s all true, but it’s not the only aspect of President Trump’s China strategy that the Chinese analyze. There’s quite a few other aspects, one of which is involving India, which is a very protectionist country. Yet, India is a new focus of President Trump for dealing with China. MANN: That, I must say, is not—I’ve watched the last two presidents at least emphasize India, so that actually is a continuity. GLASER: If I could jump in on this. GLASER: —anti-protectionism. This is a message that Xi Jinping has been sending everywhere, and it resonates in some places. So there—and there are certainly countries even in Europe that want to participate in the—in the Belt and Road Initiative. And so I don’t think that I would say that this notion of the U.S. and Europe, you know, sort of working in lockstep to block Chinese investment is really indicative of the way that the Chinese see the Trump administration. In fact, there are aspects of the Trump administration policy that I think the Chinese see as the gift that keeps on giving. We have seen, for example, Xi Jinping not only reaffirm that this is an era of strategic opportunity for China, but in fact he said in a speech last year that this is the biggest opportunity for China in one hundred years. And this is not only because of confidence in China’s own rise and its ever-expanding toolset to influence its external relationships, but also because what they see going on in the United States and what other countries—especially, of course, China’s periphery, where countries are worried about U.S. staying power in the region. And they don’t want to choose between the United States and China, but when they feel that the United States might not be quite as reliable in countries like Southeast Asia there’s going to be this drift. And there’s—China is the pull, and so there is a little bit of accommodation to China going on. So I think that they’re a little bit more confident than I guess I think you portrayed, Mike. MANN: Let me turn to the subject of human rights in the current situation. I haven’t heard a lot—that would be an exaggeration—I have heard almost nothing from the Trump administration about issues like the Uighurs in Xinjiang, certainly not from the Trump White House. I guess the first question is, to you, why not? PILLSBURY: Well, there’s a number of interesting articles that the Chinese analysts of President Trump have written about his strategy toward China, including the question of human rights and the relative lack of attention to it by the president’s statements. One interesting thing that could be true, they claim that there is a kind of hawk list of policy recommendations—American sort of super hawks on China—and they distinguish President Trump and his team from the super-hawk list. And the super-hawk list would include strong comments and even measures on, let’s say, the treatment of Uighurs in Xinjiang. It would include immediately selling F-16s to Taiwan two years ago. By the way, none of these things happened, what I’m listing right now from the Chinese list. The F-16s for Taiwan were not sold. Dalai Lama being invited for lunch or something in the White House. Nothing. Dalai Lama repeatedly said I want to come and meet President Trump; spurned. Increasing our missile defense in South Korea. Capping the THAAD at a certain level; the super-hawk community wants that raised. Never done. It’s quite a long list, actually. So I’m trying to frame for you, Jim, how the Chinese assess President Trump’s approach to China. They don’t see him as a super hawk. They appreciate some of his comments when he says things like China is slowing down; I don’t want to hurt the Chinese economy. He’s made a number of comments that could only be seen as kind of getting along with China in the future, China as a business opportunity, a great concern with how our companies are treated inside China. But he has never talked about decoupling our two economies. He hasn’t—this is, again, back to the super-hawk list, would certainly be decoupling the economies, would certainly be increasing bans on high-tech sales. You certainly don’t find this in the measures President Trump has taken yet. MANN: Interesting, on the list—so any speaking up for human rights makes you a super hawk? PILLSBURY: It makes you someone who questions China’s approach to its internal affairs. And I think you’ll notice in the president’s tweets and press conferences he’s not brought up the specific treatment even of the Canadians being held hostage because of the extradition request our Department of Justice made for Madam Meng. So the Chinese assess this as an important indicator that this is not a worst-case president who’s out to get China. There was a theory that that was the case in the first few months. I was even ridiculed, like, this list you made of things President Trump won’t do, this is clearly wrong, the Dalai Lama will be coming soon. No, he was never invited. MANN: Do we have—yes, we do have time for a question. Bonnie, you mentioned Taiwan briefly in passing. Just yesterday, I think a bill called the Taiwan Assurance Act was introduced on the Hill. Is it possible that after many years in which there were warnings of a, you know, conflict, even military, over Taiwan, and those fears turned out to be exaggerated and things were smoothed over, is it possible that it at this point, when everybody seems to think of this as a stable issue over the last forty years, that it would—it could reemerge as a—as a crisis between the two countries—between the U.S. and China? GLASER: Taiwan is, as you know, always, from China’s perspective, the most sensitive issue. And there’s always a potential for a crisis. That said, I don’t think we are hurtling towards one. Xi Jinping gave a very important speech on January 2. It was the fortieth anniversary of the Message to Taiwan Compatriots. It’s a very, very comprehensive speech, and I think he talks about peaceful unification about twenty-six times. Of course, he doesn’t rule out the use of force. 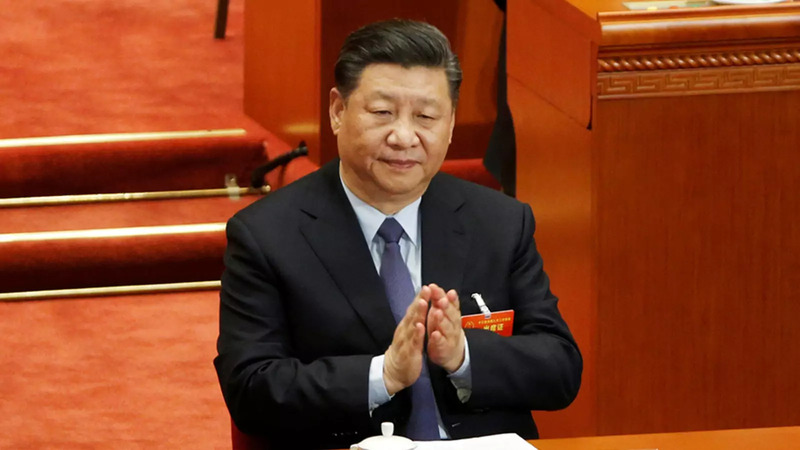 But the important—one of the important messages in that—in that speech is that Xi Jinping inherited a policy of peaceful development across the strait from Hu Jintao, and we have seen in other areas of his foreign policy that Xi Jinping has been forward-learning and willing to alter Chinese policies such as the hide your capabilities and bide your time maxim of Deng Xiaoping, which he now uses sort of fenfaio (ph) way, which is very difficult to translate, but being much more proactive and energetic. But in the Taiwan space, his policy really has been consistent. But I see a message of trying to push a dialogue with Taiwan on reunification—what it would look like, how you get there—to actually operationalize this principle. And we’ve seen a lot more pressure from China, but we’ve also seen—the Chinese always have this mix of carrots and sticks. And so now, after the election in Taiwan at the end of last year, the local elections where you had KMT mayors come back to power in municipalities, the Chinese will be buying more agricultural goods, sending their tourists to those particular municipalities. And so they will use the carrots as well as the sticks: there are bombers and fighters that have been circumnavigating the island. So we could get into a crisis if we had a president in Taiwan—and there will be an election in January of next year; that’s coming soon. And if we got a president that really was seen by Beijing as provocative and destabilizing, and at the same time if they saw the United States as emboldening that individual, you could imagine we could end up in a crisis. But today we don’t have that. President Tsai Ing-wen, although the Chinese don’t like the fact that she doesn’t accept their “one China” principle and the 1992 consensus, is not provocative. And I think that we have seen some important forward-leaning measures for Taiwan that I think are—it’s good for American interests and it’s good for Taiwan, but I don’t think that it is—that these are the kind of steps that are going to provoke a response from Beijing. So I don’t see the situation as unstable, but I think eventually we could get to a point where there would be a crisis. And we should do our best to avoid one. KATZ: Make it brief, yeah. MANN: I know that time is ticking. KATZ: Yeah. I assume that at least some in the audience are interested in current negotiations toward a trade agreement, and I just wanted to draw your attention to one of what I think USTR is calling major, major issues, and that is the question of enforceability. As you may recall, in May 2018 a major delegation went to Beijing with a four-page framework which Eswar Prasad called more like the basis for surrender in terms of negotiation. And the delegation was supposed to have a welcoming dinner; that was canceled. They were supposed to start negotiations the next morning at nine o’clock; those were pushed back to three o’clock. And I want to call your attention to the fact that USTR is still in the same place, calling for unilateral enforcement of the deal; namely, if China doesn’t live up to its commitments, the U.S. should have the untrammeled right to retaliate, China should not have any such right. One of the Chinese vice ministers said if there’s any enforcement mechanism it must be fair, equal, and two-way. And so I think they have a long way to go on that issue. And if you’d like to discuss it more during Q&A, be happy to turn to it. At this time I’m going to invite members to join our conversation with their questions. A reminder to you all that this meeting is on the record. So wait for the microphone, speak directly into it, stand, give your name and affiliation, and keep the question short and singular. PILLSBURY: And I hope we can hear from some of the authors of books on China I see in the room. Warren Cohen has an uncountable number of books. Paul Heer has a new great book called Mr. X and Asia (sic; Mr. X and the Pacific). He’s sitting in the back row. George Kennan’s concepts were that this should not happen, China would remain a kind of agricultural power. That didn’t sort of work out. And if you want to know all about George Kennan’s thoughts on Asia, buy Mr. X and Asia (sic; Mr. X and the Pacific) after you buy Warren Cohen’s book on U.S.-China relations. (Laughter.) Not to mention Ambassador Director Negroponte, who’s waiting to write a book on his memoirs until—(laughter)—he gets all the documents. MANN: Look at that, you succeeded in getting Mr. Negroponte. Yeah. Q: Yeah. Thank you. John Negroponte. About five or six years ago Wang Yi, the foreign minister, gave a talk over at CSIS and he listed five principles of Chinese foreign policy. And if I’m not mistaken, either the first or the fifth—I forget which—was to uphold the international system as it was created in the post-World War II period. He said that was a fundamental principle of Chinese policy. Did he mean it? And is it still China’s policy? GLASER: I’ll star with that. GLASER: I think that’s really a—it’s an important question, and it goes to the issue of not only what China’s rhetoric is but what its policy is in practice. So in rhetoric, yes, the Chinese continue to say that they uphold the international order. But they have some areas of dissatisfaction. They’re not always clear about what they are. They push back against the accusations that they are a revisionist power, which of course was the language in the December 2017 National Security Strategy where the Trump administration put China and Russia in the same basket as revisionist powers. And I myself think of China as a selective revisionist power. And if you look at areas at—in the U.N., the Human Rights Council for example, where the Chinese have really pushed the idea of human rights being a concept that is very broad, not just individual freedoms but should be determined by economic development and economic means, the Chinese have introduced two resolutions in the last two years in the Human Rights Council that have baked their norms into the—into the discussions there. Internet governance is another area where they’re working very closely with Russia to protect the concept of cyber sovereignty, where the state and its interests come before that of the individuals and their right of access to information. So I think it’s pretty—the Chinese do not deny that they want to make these changes. They say there are areas in the international order that are unjust and unfair. But they present themselves, as you say and as Wang Yi said at CSIS five years ago, that they are upholders of the international order. KATZ: I just want to make a small intervention on that. KATZ: I think, Ambassador Negroponte, it’s ironic that because of the lack of sympathy right now for WTO in Washington, China has been able to portray itself in Geneva as the great supporter and upholder of the system. And yet, at the same time, its industrial subsidies policy is far, far from what was contemplated by the WTO. PILLSBURY: I’m not sure I agree. I think I would introduce the topic that’s not new to the director of national intelligence: deception. Sometimes foreign countries use deception. Sometimes even America uses deception. It’s beyond just a misunderstanding or nuance. China’s internal writings, which I cite in The Hundred-year Marathon, specifically talk about the need to penetrate and benefit from the world order, but—which they’ve done. They have a chart, actually, they’ll give you of how many U.N. specialized agencies they either have the director or the deputy director. The roles they have in the whole world order are really quite extensive, which befits the second-largest economy in the world. Q: Thanks, Jim. I’m Ali Wyne. I’m a policy analyst with the RAND Corporation. Xi Jinping talks a lot about achieving the Chinese dream, the great rejuvenation by—achieving the great rejuvenation by 2049. How do you interpret those abstractions vis-à-vis the United States? And that is to say when he talks about achieving the China dream, reclaiming a certain position, moving to center stage in world affairs by 2049, where does he envision China as being vis-à-vis the United States? Does he imagine parity, or does he imagine China as being—as replacing the United States for global preeminence? GLASER: Do you want me to go first so that you can disagree? GLASER: I think that it’s too simple to say that Xi Jinping wants China to replace the United States. I think that Xi Jinping envisions China being a leader, but a different kind of leader. Xi Jinping doesn’t want China to be the United States of the world, the world policeman, sending its forces around the world to remove leaders from power that they don’t like. I think that the Chinese do want to be a leader. I think it begins first with making the world safe for China. And this is particularly true in China’s own periphery, where China does not want any country to take any steps that are damaging to Chinese interests. But of course, this goes beyond their immediate neighborhood. This is—obviously, the measures they’re taking against Canada, as we see, and Australia, and the Europeans when they misbehave, the Chinese punish countries that damage Chinese interests. And so that’s the first thing, is they want the world safe for China. They want the United States to be less important. A precipitous decline of the United States I think is actually problematic for China. They want the opportunity to manage this process, and as Mike said, manage the decline of the United States. That’s very much seen as in their interest. So I think yes, China has the—or at least Xi Jinping has the ambition to be leader of the world. But I think in his mind the concept of leader is very, very different than what the United States is today. So I wouldn’t just say supplant the United States. MANN: Mike, you probably have some thoughts on this. PILLSBURY: Well, everyone should know Ali Wyne has a kind of a blog where he lists people he—who influence him, and I think he has both Bonnie Glaser and me on the list. (Laughter.) We want to stay on your list. But I think the Chinese dream is a topic that needs to be unpacked in great detail. The Chinese seem to include in that concept that China will have enough friends in America, especially if their influence operations are conducted properly over the coming twenty or thirty years, that the Americans will—I mean, there will be some hard cases who will never accept China surpassing America. Perhaps President Trump will be in that category because he’s twice now said China wants to surpass us, but it won’t happen on my watch. They don’t like that attitude. They want Americans to welcome China’s rightful assumption of its previous global role. So, to do that, they need goodwill. They need complacency. They need all of the federal programs that I talk about in Hundred-year Marathon to continue. We have a number of aid programs to help China. Every department of our government has a relationship with their Chinese counterparts. We transfer American scientific discoveries—the National Science Foundation does this—usually within thirty days of the discovery or the Chinese will complain. There’s an office in Beijing that does this. So they need all this assistance from America. They need American investment. They need our technology, legally or illegally. They have quite an agenda that the China dream needs the Americans to go along with it and not stop it or not resist. You don’t have to be enthusiastic, but at least be complacent about it. And I think they’ve done extremely well in this area. It’s not to say people are dupes or, you know, they don’t really think that, but China gives them a million dollars in a briefcase. No. People honestly believed it, including me. I was one of the champions that China, you know, G-2, that’s how the world should be governed. I was really totally wrong. And I at least have confessed it, maybe even too much. But not everybody has come forward yet with their confession. And the Chinese know this. And so they think the China dream is still possible, even with President Trump. MANN: At the back, yes. Right—yeah. Q: Thank you very much. Joe Cirincione, Plowshares Fund. This is for Bonnie Glaser. I think that there are a range of views around the region. And there are some countries that are more nervous than others. But I do think that there have been steps that have been taken by the Trump administration, to be fair, that have been reassuring. The stepped-up presence in the South China Sea would be an example. The effort to create a strategy of incentivizing private capital to build infrastructure, raising the cap on OPIC funding to sixty billion (dollars), so about doubling it, the attention that has been paid now to the South Pacific. All of these things I think are reassuring. And I talk to our allies, and particularly Australia and Japan, that feel that there are some very important things that the Trump administration is doing that, frankly, the Obama administration didn’t do. They’re all very disappointed about the withdrawal from TPP. There is no doubt about that. This was seen as the most potentially strategic thing that all of these twelve—then twelve—countries could do to influence China. It would be very difficult, for example, to change the industrial policy, some of these practices unilaterally, but we could do so as a group of countries, and then eventually with TTIP with Europe. And so I think that that’s seen as a huge disappointment. So I think it depends what we’re going to do going forward as how—where they all fall. But the vast majority of countries really do not want to choose between the United States and China. And you can see Prime Minister Abe preparing for his summit with Xi Jinping. Modi had a—from India, the prime minister—had a summit last year, very important one, to stabilize his relations with China and Xi Jinping. They have—he has elections coming up. I think that was one of the drivers. But it’s also countries that are positioning themselves in ways because they have some uncertainty, I believe, about U.S. policy toward the region. But it’s not, by any means, a lost cause. KATZ: Just a footnote to reinforce what Bonnie said about TPP. Many of you probably know that it was USTR that created and negotiated the chapter of TPP that deals with state-owned enterprises. And that was the first time that was extensively dealt with in any international trade agreement. It’s subsequently been picked up in some other trade agreements, but apropos industrial policy it clearly was a nose under the tent of starting to get a handle on that. So another reason for regret that was lost. Of course, it survive among the other countries. Q: Thank you very much. I’m Don Daniel, emeritus professor at Georgetown, also an occasional lecturer at Nanjing University. The Economist just had an issue just a short while ago, maybe one or two weeks ago, to the effect that basically China’s economic power is really sputtering, if we can put it this way. They’re running into very, very serious issues. And I’m wondering kind of where you think—and Brookings Institution, for instance, had a—had a study done which says, hey, they’re talking about 6 percent economic growth. It’s probably closer to 4 to 4.5 percent economic growth. The numbers just simply aren’t there to kind of support that. So how does that get into your calculations about the challenge that China poses for us? PILLSBURY: All three of us? KATZ: I’ll defer to the other two, who pay more attention to domestic China. Go ahead. PILLSBURY: There’s a lot of wild guesses about the Chinese growth rate, the size of the Chinese GDP. You can get in The Economist—and, by the way, I heard a rumor The Economist Beijing Bureau chief is here in the room with us today. So you may want to express your admiration of The Economists coverage of China to him in person. Michael Pettis and Gordon Chang, very different views ideologically. They both have estimated the Chinese GDP is half of what the World Bank says. In other words, six trillion (dollars), not twelve trillion (dollars). You’ve got people claiming that China’s growth rate for the last few years is only 1 or 2 percent. We’ve got people claiming it’s even above what China claims. This causes a great problem with measuring the balance of power between the U.S. and China. Are we dealing with a kind of Gordon Chang, Coming Collapse of China—by the way, that was the bestselling book on China from 2001 to about—until Henry Kissinger’s book came out. Gordon Chang’s thesis is China will collapse soon—totally collapse. And he spells it out in great detail. He’s joined by many others. So if you’re President Trump, and you’re being told this—which I think he’s not, but if it were the case—(laughter)—you would think: My God, this is a pushover. This is a house of cards. I just tap them a little bit on the chest and they’re going to fold and accept all kinds of enforcement mechanisms. On the other hand, if you go with purchase power parity, the original research being done by a team at the World Bank, then China surpassed us several years ago. They’re really, let’s say, twenty-one trillion (dollars) and we’re nineteen trillion (dollars). So the range—there’s similar debates about the military balance of power between the U.S. and China. I just was listening this morning to three DOD witnesses—Randy Schriver, Admiral Davidson, and our forces commander in Korea, General Abrams. They all three were talking about the shortage of munitions, the shortage of platforms. They’re not getting—they’re telling the House Armed Service Committee: We are not being funded by what we need. One congressman asked specifically: In a military combat between the U.S. and China, could we win? And the admiral hedged and said: We’re going to be losing our qualitative superiority against China by 2025, which is a DOD official position. We’ve already lost a quantitative superiority in a number of areas. So whether you’re talking about the military balance or the economic balance, getting a fix on is China stronger than us, weaker than us, about the same—this is a very important question. And it’s what net assessment’s Andy Marshall used to tell us about thirty years ago. What if China turns out really differently than the way George Kennan was talking? That’s, I think, the situation we face right now. And I, myself—I can’t speak for Sherman and Bonnie—but I, myself, am very confused reading all the different economic forecasts and comments about China in Washington, D.C.
GLASER: So I would just add—I’m probably in agreement with you, Mike, that there’s just—there’s a lot of different analyses and different forecasts. We would be mindful to pay attention to the challenges that China faces. And one very big one is the demographics in China. As they have basically eliminated the One Child Policy, but women just don’t want to have children. A lot of them don’t want to get married. And they certainly don’t want any second child. So this is—I think that’s just one example. And then local debt is another. So the real question is then what implications do these economic challenges have for Xi Jinping’s hold on power? And I don’t know the answer to that, but I think that’s something we have to pay attention to. It’s worth mentioning that there’s a lot of criticism of Xi Jinping today in China. If you talk to the elites, the intellectuals, there are a lot of people—and, in fact, Bob Lighthizer said this in an NPR interview, I think, yesterday, where he raised the idea—and of course, he didn’t say who, but I think he was talking about Liu He being a reformer, pushing for greater economic reform. And, yes, there are many economists in China who think that Xi Jinping is not on the right path economically. There’s criticism of Xi Jinping for not really managing well the relationship with the United States. So what’s really interesting to me is whether this will in any way affect his power. And my view, thus far, is that Xi Jinping has enormous support from the average population in China. So maybe this is a good analogy with our current president, that he has his own sort of populism and nationalism support that comes from the masses, and he doesn’t really care very much what the elite thinks. MANN: Let me just add one question. What about support within the PLA? Is there any sign of an erosion of support there? MANN: This is before Xi. GLASER: Before Xi Jinping. So I’m sure it has not been completely eliminated, but if you were somebody at a very high level you though—he’s already taken down some very senior officers in the PLA. So I think at the senior level there’s fear. And there is a sense that he’s gone too far in the anticorruption drive. But I think at the rank and file level he’s had a lot of support. MANN: OK. Back to the members, other—there was someone here. Yeah. Q: Hi, thanks. Kathryn Harris from Govini. This is for—Kathryn Harris from Govini—questions for anyone who wishes to answer. I was curious on your thoughts of China as a technology-enabled surveillance state, and implications for global security. MANN: And what should we do about it? PILLSBURY: Well, the Wall Street Journal has kind of taken this on as a frontpage story the last two or three months. A lot of people know now about the social credit systems. The scary thing is that China intends, and I believe they do, to market these high-tech software surveillance camera—it’s kind of a package. And you name the country, you can buy this package now. And so you can develop your own national database of faces, and which magazines the person subscribes to, if they come to Council on Foreign Relations meetings or not. And then you—if you arrest this person for jaywalking, you can—the police can do a quick check, get their entire social credit, as it’s called, background, and then decide what to do. Some people kind of like this. They’re law and order people. Yeah, that’s a good thing. Keep track of the criminals. PILLSBURY: (Laughs.) Both. Others think this is horrifying. And if there was a concept of freedom, liberty, that our founding fathers believed in, and privacy, frankly, too, from the Supreme Court interpretation, all this is put at risk by this Chinese program. On the other hand, American companies see opportunities in this. So it’s a policy question whether this should be tolerated. It’s not part of—it’s not a violation of the WTO, but it raises, again, this whole complex of what will China look like in twenty or thirty years. And let’s just assume for a second that you’re upset about this and you don’t like it. What are you going to do about it over the next twenty years? Will you be joined by a million Americans who boycott Chinese toys, you know, because of the social credit surveillance system? They’re betting you won’t. You’re going to be a little worried, but then turn the page and read the sports section. And I think the Chinese are right. Our level of outcry about Chinese human rights violations has not been very serious—not just President Trump, but previous president—in terms of sanctions and, you know, real pressure. We don’t have the Helsinki Final Act basket three with China. They have gone onto the idea of the color revolution. That this is an increasing topic—I don’t know if you’ve seen the term black swan and gray rhino. Any Mandarin speakers here have to know this new phrase from President Xi himself. Black swan is hēi tiān'é and gray rhino is huī xīniú. These are the two great threats, he says, China faces. And there’s no further explanation. But it looks like it’s internal unforeseen events, is the black swan. And then threats that should have been seen is the gray rhino. And the social credit system seems to be—among many other steps they’re taking—seems to be designed to deal with all of this. Do Americans really care that much that they would say, OK, you know, no more of this or that and sanction China? It looks like the answer is no. GLASER: If I could just add one sentence. When Xi Jinping spoke at the 19th Party Congress, and he presented this notion that China’s development model is an option really for other countries, I think in his mind that this surveillance capability is part of that development model, and China is exporting it. And you can see this in the One Belt, One Road standards that China is pushing around the world. And we should be worried. MANN: We have time for one or two more. Yes, Priscilla Clapp. Q: Thank you. Priscilla Clapp, U.S. Institute of Peace. Is noninterference still bedrock of Chinese foreign relations, or do they not really talk about it anymore? Because they’re certainly not practicing it—noninterference in the internal affairs of other countries. GLASER: Noninterference certainly remains part of the rhetoric, the principles of Chinese foreign policy. There may come a time that China will completely walk away from that, but like every other aspect of Chinese foreign policy it is always rethought, redefined. I think that the Chinese do not want to get bogged down in parts of the world where they would be distracted and then potentially their great Chinese dream could become derailed. They look at some of the things that the United States has done and say—(laughs)—we don’t want to do that. And even probably some of Russia’s adventures. But, yes. I mean, interference in internal affairs has taken on a more important role in Chinese policy. They just don’t acknowledge that it’s interference. It’s—I think more it’s just a matter of definition. PILLSBURY: I agree. I would just add, Priscilla, that another author in the room, by the way—back to John’s question, too, about the principles of Chinese foreign policy—they have been flirting with responsibility to protect. If you look at the Gareth Evans book, the Chinese did not—they should have said no. No responsibility to protect. We’re not going to for it in the General Assembly because it means you foreigners could come into Tibet or Xinjiang. They didn’t. They seemed to be saying, you know, we endorse the U.N. General Assembly on responsibility to protect. That has enormous consequences. They’re already by some counts the largest contributor to U.N. peacekeeping operations. So they’ve got these new movies. I don’t know if you’ve seen the movies about the wolf totem. They’ve got these wonderful movies with English subtitles on how China is the world’s enforcer of the world order in the U.N. And one of them is a Sudan-type country, where the Chinese PLA forces go in, you know, and establish order. But they’ve got a scene in each case where they make sure they have the U.N. Security Council mechanism behind them. So I would say—I agree with Bonnie—they have dropped quietly one of the five principles, that they’ll never intervene in the internal affairs of other countries. And this may come back to haunt them. As I said, we don’t Helsinki basket three with China. But we do have some tools like this, where they—where some faction in China gets the president to sign these things. MANN: We have one person who’s been waiting for a long time. Last question, I think. Q: Thank you. Thank you very much. Marcelle Wahba at the Arab Gulf States Institute. And we look at China quite obviously from the perspective of the countries in the Middle East, especially in the Arabian Peninsula. And while we—I think we understand their motivations for the widening, broadening of relationships with China, I wondered if some of you could comment on China’s priorities and strategies as they look—as they look at that region, specifically with countries like the UAE and Saudi Arabia—beyond the usual energy trade relationship. PILLSBURY: OK. Just a couple sentences. They look on UAE and Saudi Arabia as quasi-allies. They are very proud—and, again, this is China Daily—they’re very proud of Crown Prince MBS’s visit and $28 billion of deals while he was there. They have problems with the Turks, because the Turks have started to make trouble over their brothers—distant brothers—the Uighurs. But generally speaking, the Arab countries have not made a lot of trouble over treatment of the Uighurs, perhaps because they’re seen not as Arabs but as Turks. So I would say the region you sort of represent is seen by China as countries that—Egypt I would include as well. Egypt, by the way, sent home Uighurs. MANN: OK. We have come to an end. PILLSBURY: Anybody else? Sorry to talk so long. GLASER: We’ve already gone over, so maybe you should—yeah.